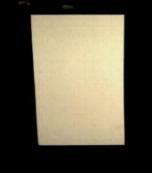 1" THICK OFF-WHITE FELT material for wide variety of usages. Made from 100% wool in Hard density (0.36 gm/c3 - F-1). Density is calculated as grams per sq. cm. Due to another drastic postage increase starting January 3, 2018, for the 3rd time in a row, we are forced to increase our prices. This felt is heavy and all sizes have to ship by Priority mail. Thank you for your understanding.